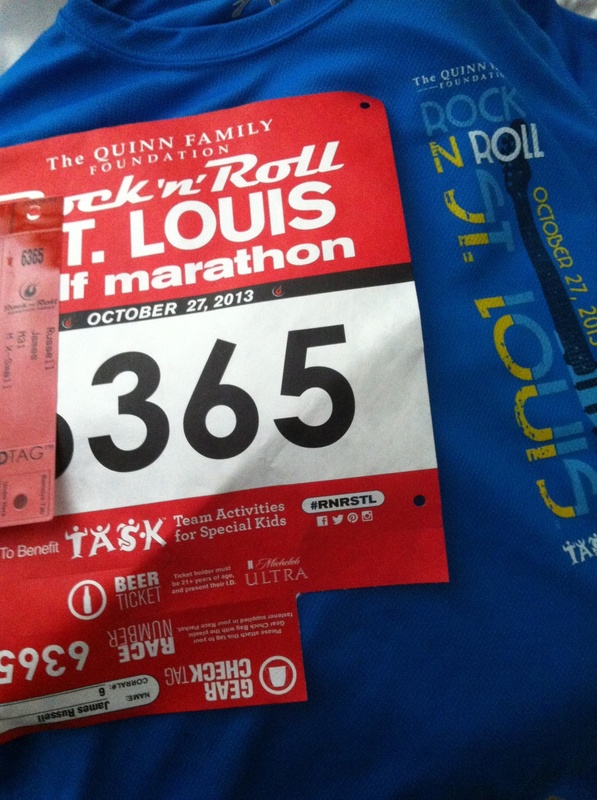 On Saturday morning we went to the packet pick-up where JMR got his bib, race shirt, and race schwag. After wandering around the expo for a while, we left to grab lunch and (finally) pick up Lola. Poor Lola, she was in the shop for a whole month. Bad owner. To my credit, I can’t lift heavy things yet, so I couldn’t pick her up by myself. Plus, it’s not like I am in a rush to get back on the bike since I can’t ride yet either. After doing some serious resting on the couch, we went to Farotto’s for dinner that night, the place JMR swears helped fuel his speedy 10k race a couple of weekends ago. Hopefully the mostaccioli will help fuel a good race on Sunday! 5am. Ugh. Now I know how JMR feels when he gets up early to sherpa/spectate at my races. I guess it’s just easier to wake up when you’re the one racing because you have pre-race nerves and adrenaline. I had none of those, except sleepiness. After bundling up in multiple layers (it was supposed to be 32 degrees at the start) we were off and headed downtown by 6a. Parking turned out to be pretty easy and we were walking to the start by 6:20. 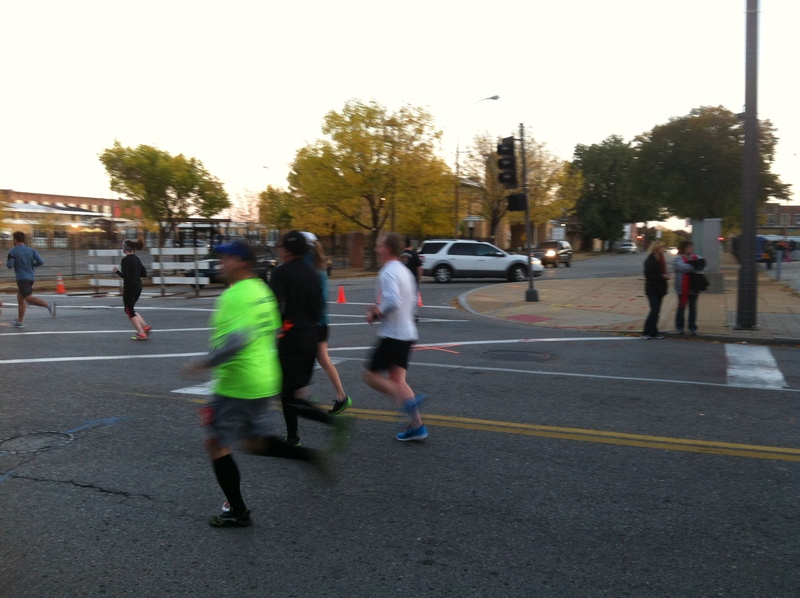 After a porta potty stop and some stretching, it was finally 7a and the racers were off! JMR was in corral 6, so it took a while for him to cross the start (9 minutes or so?). The half course is pretty spread out around downtown, so unless you have a bike, there aren’t very many good places to see a runner more than once out on the course and still see them at the finish. So I decided to walk as far as I could and then just wait to cheer on JMR. ‘Far’ ended up being the 2 mile mark 🙂 I tried to take a picture but my iPhone photo skills kind of stink. He’s the blurry one in the white shirt. Next I was off to get hot chocolate -my fingers were freezing! There was a coffee shop a few blocks down so I hung out in there for a while and followed JMR’s splits (I signed up to receive text messages when he crossed the start, 5k, 10k, 10 mile and finish). As I calculated his finish time based on his 5k split and then his 10k split I could see he was speeding up! If he could keep it up he would make his goal time! 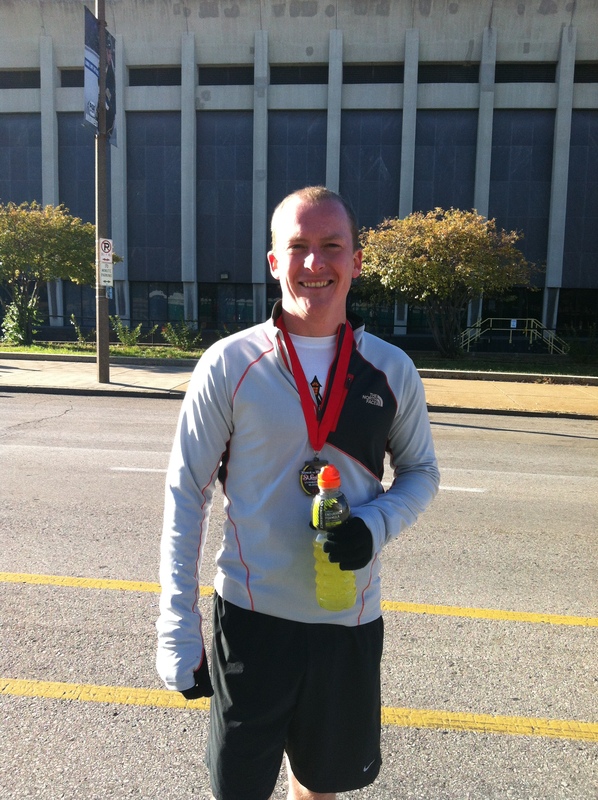 Then when I got the text for the 10 mile split I knew it was time to head to the finish. I couldn’t figure out which side to cheer him on, one side was blocked off so you couldn’t be right next to the runners and the other side was really crowded. Finally I just picked a side and waited. I was getting anxious and nervous. 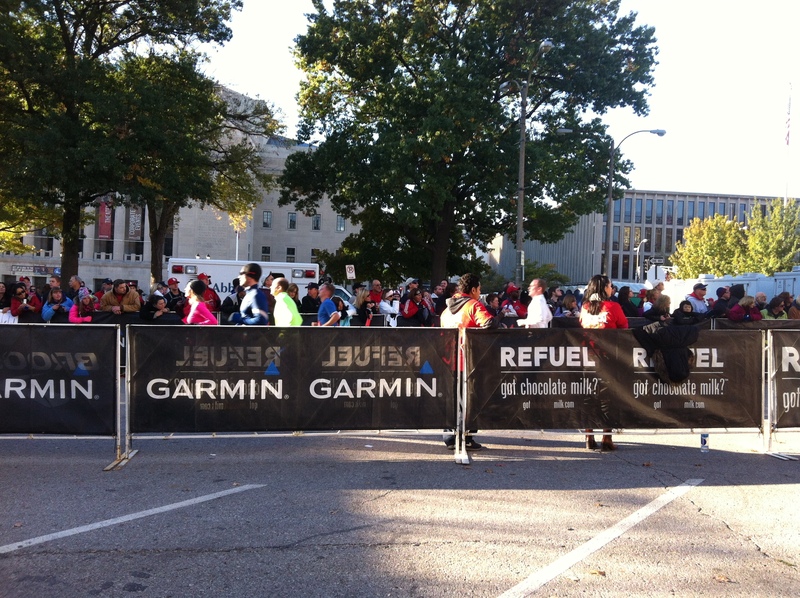 Soon I spotted JMR headed down the finish line, he was looking really strong! When I looked at his time I couldn’t believe it! He beat his goal! 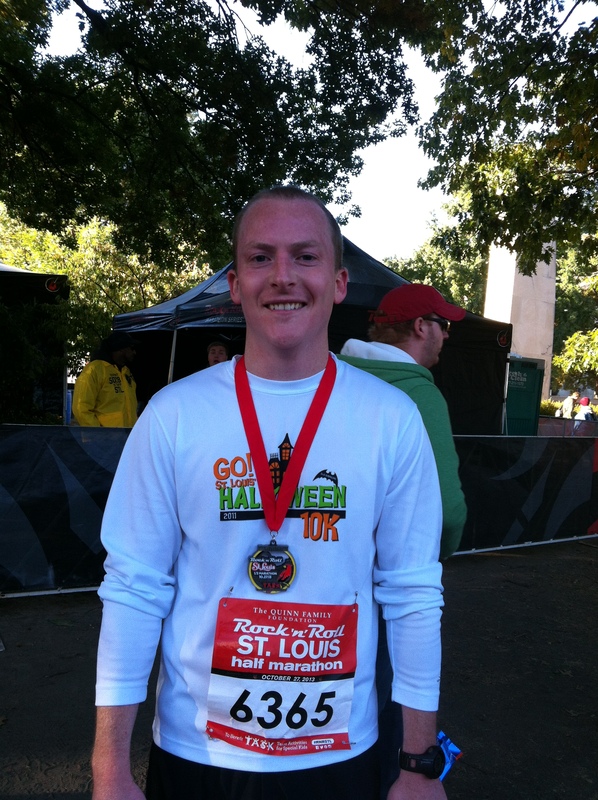 He was hoping to finish in 1:45 and his time was 1:44:38!!! He said he just wanted to break 2 hours so anything under than that he would be happy with, so I knew he was thrilled with his time. I met him on the other side of the finish and gave him a huge (sweaty) hug. 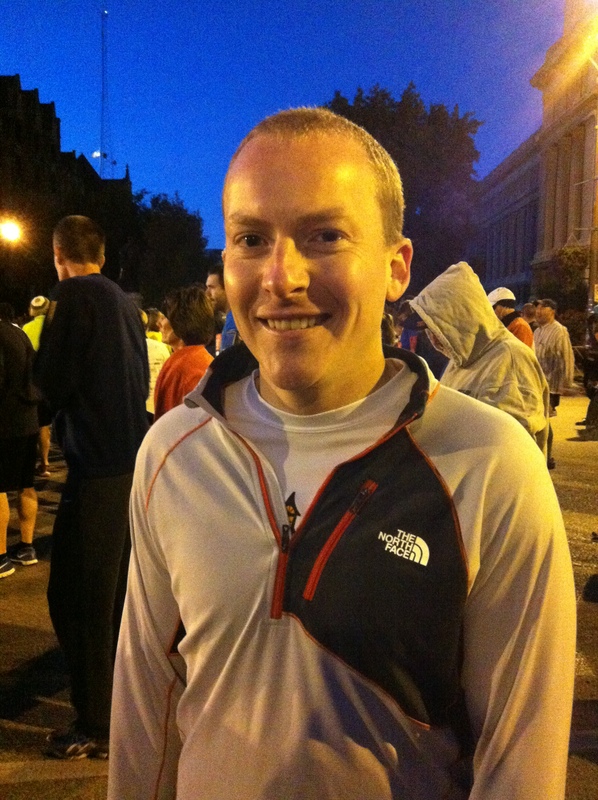 He recapped how his race went and how he was feeling (tired but good!) and after hanging out at the finish area for a bit we headed back to the car to go home. After eating and drinking something. He looks a little more refreshed! After getting cleaned up we went to Milagro, one of our favorite Mexican restaurants for lunch. I think Mexican food after races is becoming our tradition. 🙂 Lunch was followed by watching football (well, just JMR) and a nap on the couch.